OTHER SIDE: According to R.E.A.L. 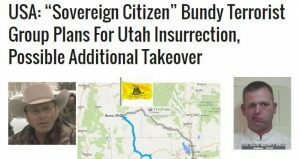 "'Sovereign Citizen' Bundy Terrorist Group Plans For Utah Insurrection, Possible Additional Takeover" | RANGEfire! A group calling itself R.E.A.L. — Responsible for Equality And Liberty — says it is continuing to report on the ongoing lawless activities of the “Sovereign Citizen” based terrorist group, led by Bundy brothers Ammon Bundy and Ryan Bundy. R.E.A.L. has reported on the armed terrorist takeover of the Bundy-led group of U.S. Federal Government facilities and Malheur wildlife refuge outside of Burns, Oregon, and the growing numbers of “Sovereign Citizen” terrorist extremists that have arrived in convoys to assist and protect the core Bundy terror group. The FBI has stated: “the FBI considers sovereign-citizen extremists as comprising a domestic terrorist movement.” Law enforcement has issued videos to police on how to deal with such dangerous domestic terrorists, who do not respect law and order. The Department of Homeland Security reported in a February 2015 reportthat it viewed the “Sovereign Citizen” or what it also calls “Sovereign Citizen Extremist” (SCE) domestic terrorists as a dangerous national threat. The Homeland Security report, produced in coordination with the FBI, counts 24 violent sovereign citizen-related attacks across the U.S. since 2010. R.E.A.L. has learned this included terrorist travel by LaVoy Finicum and Ryan Bundy from their terror siege in Burns, Oregon on an 11 hour, 700 mile trip (each way) to meetings in Cedar City, Utah. There was no effort by law enforcement to serve any arrest warrant or to stop these armed men who have been holding USG buildings and facilities hostage during this 24+ hour, 1,400 mile travel. A local writer in Utah, Chris Zinda, had his photograph taken with “Sovereign Citizen” terrorist LaVoy Finicum to provide proof that Finicum had gone all the way to Cedar City, Utah, without being stopped by law enforcement. Iron County, Utah Commission David Miller is part of the American Land Council (ALC) and appears in their videos promoting their cause. David Miller has also been involved in zoning of lands in Iron County to influence ownership rights. The ALC group is led by Ken Ivory, with the goal to transfer public lands away from their rightful federal government ownership. “Sovereign Citizen” Terrorist Ryan Bundy lives in Cedar City, Utah, and has previously been arrested by Iron County police. Bundy had previously been arrested for a nuisance charge stemming from 2013 activities, and court activities on this have continued to be delayed, as of September 2015. In January 2015, Ryan Bundy was also served an arrest warrant for resisting arrest. In May 2014, Reuters reported that “Sovereign Citizen” terrorist Ryan Bundy led hundreds of extremists to directly challenge federal control of protected land in Utah, driving dozens of all-terrain vehicles into protected land in Recapture Canyon in Utah that is home to Native American artifacts and where such journeys are banned. The current Finicum video indicates that the “Sovereign Citizen” terrorist group is planning further activities to reject the legal rights and authority of the U.S. Federal Government in Utah, likely in Iron County, and very possibly another takeover of USG buildings and facilities in Utah, similar to their current terrorist occupation of USG facilities in Oregon. The Anti-Government III Percent extremists and Oath Keepers have also been part of the Oregon extremist takeover activities, with convoys of armed Anti-Government extremists supporting the “Sovereign Citizen” terrorist group, roaming Eastern Oregon streets at will, without any consequences. The “Sovereign Citizen Extremists” (SCE) seem to be actively “crowdsourcing” terrorism in the same way that ISIS has been doing, and now seeks to hold terrorist control of physical land, just like ISIS has been doing. Such “crowdsource” tactics defy conventional counterterrorism defense practices of following well-structured and known terrorist cells, and seek recruitment of previously unknown actors to join the terrorist “movement.” Further, the more success terrorist have in such “crowdsourcing,” the more effective such “crowdsource” recruitment efforts can be in inspiring disaffected individuals who might not previously known or considered supporting the terrorist group, and creating a false appearance of “legitimacy” to their cause. In the 21st century, and especially given the vast and sweeping social media tools for reaching the public in 2016, relying on counterterrorism tactics from the 1990s as the primary solution for stopping “crowdsourced” terrorist activity would be in denial of the reality of our modern times and challenges.